How Ford tuned the in-car audio for its new B-Max | What Hi-Fi? Here's an interesting insight into how the big car makers fine-tune their in-car audio systems on new models. Ford selected a special playlist when its acoustic engineers were developing the sound system for the new B-Max multi-activity vehicle, unveiled at the Geneva Motor Show. Radiohead, Black-Eyed Peas, the Eagles and jazz legend John Coltrane rubbed shoulders with classical composers Vivaldi and Carl Orff on the Ford playlist as engineers used key moments in the songs and pieces to fine-tune the sound system. "Every car – like every room or auditorium – has unique acoustic qualities," explains Ford. "The size and shape of the cabin, the materials in the seats and dashboard, the ratio of glasss to steel – all of it impacts on the sound quality of a new vehicle." The classic opening to The Eagles' anthem Hotel California features the ideal "dry" sound for testing bass, ambience and tone, says Ford of Europe audio engineer Matthias Terstegge. While the powerful kick bass in the Black Eyed Peas' track Just Can't Get Enough is ideal for testing the woofers and making sure the punchy bass doesn't cause door buzz and rattles. Treble is sensitive to seat positions, says Terstegge, so his team of engineers tuned the tweeters using Vivaldi's Four Seasons and John Coltrane tracks to ensure a good front/rear balance. "Creating a great-sounding system is much more than just choosing a good quality amplifier and speakers," adds Terstegge, a guitarist whose passion for music and electrical engineering background led to his current role at Ford. The Ford B-Max will be available with an exclusive Sony audio system with eight high-performance speakers and a 4x25W Sony amp. There's a built-in CD/radio with DAB, and USB or Bluetooth connectivity for portable devices. You can link to the full Ford playlist here. 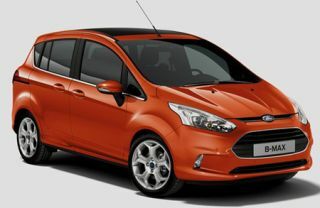 And find out more about the Ford B-Max on our sister site Autocar.co.uk by following this link.